Engineer: Remember to tip 18%, everybody. Mathematician: Is that 18% of the pre-tax total, or of the total with tax? Physicist: You know, it’s simpler if we assume the system doesn’t have tax. Computer Scientist: But it does have tax. Physicist: Sure, but the numbers work out more cleanly if we don’t pay tax and tip. It’s a pretty small error term. Let’s not complicate things unnecessarily. Economist: Forget it. Taxes are inefficient, anyway. 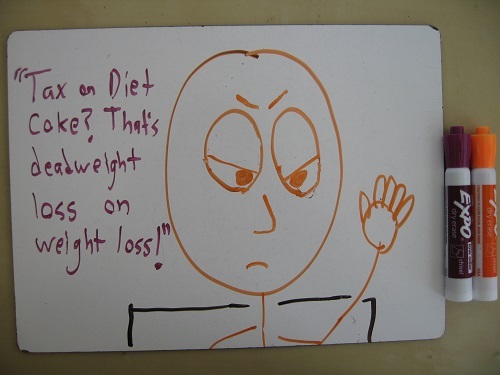 They create deadweight loss. Economist: I mean it! If there were no taxes, I would have ordered a second soda. But instead, the government intervened, and by increasing transaction costs, prevented an exchange that would have benefited both me and the restaurant. Engineer: You did order a second soda. Economist: In practice, yes. But my argument still holds in theory. The computer scientist lays a smart phone on the table. Computer Scientist: Okay, I’ve coded a program to help us compute the check. Mathematician: Hmmph. Any idiot could do that. It’s a trivial problem. Computer Scientist: Do you even know how to code? Mathematician: Why bother? Learning to code is also a trivial problem. Engineer: Uh… your program says we each owe $8400. Computer Scientist: Well, I haven’t de-bugged it yet, if that’s what you’re getting at. Physicist: This is a waste of time. Let’s just split it evenly. Economist: No! That’s so inefficient. Let’s each write down the amount we’re willing to put in, then auction off the remainder at some point on the contract curve. Mathematician: Like most economics, that’s just gibberish with the word “auction” in it. Engineer: Look, it’s simple. Total your items, add 8% tax, and 18% tip. Mathematician: Sure. Does anybody know 12 plus 7? Mathematician: What do I look like, a human calculator? Numbers are for children, half-wits, and bored cats. The engineer looks at the cash they’ve gathered. Engineer: Well, the total was $104, not including tip… and so far we’ve got $31.07 and an old lottery ticket. Physicist: Close enough, right? It’s a small error term. Mathematician: Which of you idiots wasted your money on a lottery ticket? Economist: I should mention that I’m not planning to eat here again. Are any of you? Computer Scientist: What does that matter? Economist: Well, in a non-iterated prisoner’s dilemma, the dominant strategy is to defect. Economist: We should be tipping 0%, since we’ll never see that waiter again. 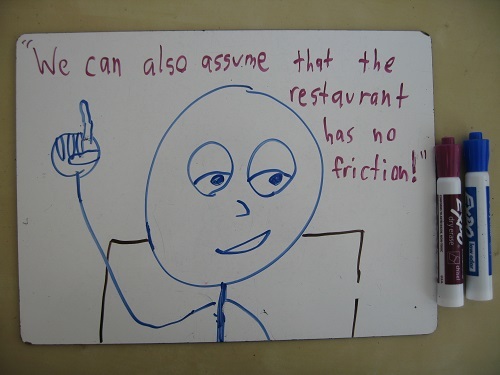 Physicist: Will the waiter really care – 0%, 20%? Let’s not split hairs. It’s a small error term. The engineer looks up from a graphing calculator. Engineer: All right. I’ve computed the precise amount each of us should pay, using double integrals and partial derivatives. I triple-checked my work. Mathematician: Didn’t we all order the same thing? You could have just divided the total by five. Engineer: I could? I mean… of course I could! Shut up! You think you’re so clever! Economist: So, we’re all agreed on a 0% tip? 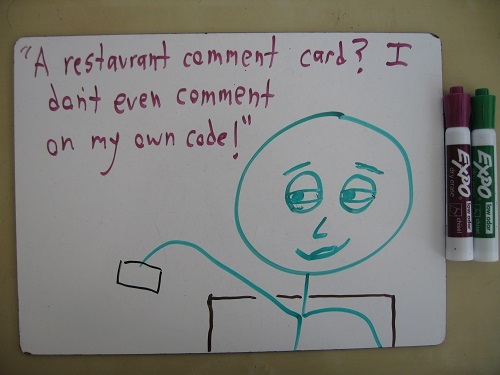 Computer Scientist: Well… the waiter did only bring two orders of fries for the table. Physicist: We only ordered two. Computer Scientist: Exactly. We got the 1st order, and the 2nd, but never the 0th. Economist: I’ll be frank. At this point, my self-interest lies in not paying. And the economy prospers when we each pursue our individual self-interest. See you later! The economist dashes off. The engineer and computer scientist glance at one another, then follow. Mathematician: Looks like it’s just me and you, now. Physicist: Good. The two-body problem will be easier to solve. Physicist: By reducing it to a one-body problem. 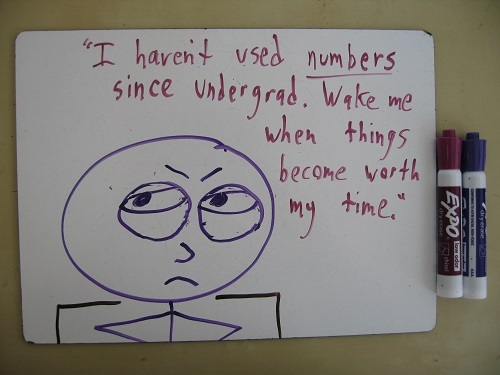 Mathematician: Wait! Come back here! Waiter: I notice your friends have gone. Are you done with paying the check? Mathematician: Well, I’ve got a proof that we can pay. But I warn you: it’s not constructive. very funny and entertaining. i laughed hard on the part where the mathematician points out the engineer’s approach on solving the problem. all we can learn from here is some times thinking too much is not so good after all. Thanks! Overthinking is always a danger. Whatever their other foibles, mathematicians are pretty good at taking a step back to see problems in a new light. I laughed when the computer programmer offered his buggy program up as a solution to calculating the tip, and the gobbletygook the economist offered. If paying in cash, I don’t tip on the tax, since the restaurant doesn’t get the tax — it only collects it. If paying by credit card, however, the credit card company takes 3%-5% off the top before anything else, including the government and the waiter, so I compensate by boosting the tip, and the simplest way to do that is to tip on the after-tax amount. Better yet would be to tip in cash anyway, because that way the waiter gets their money today, not when the boss gets around to it. That’s actually really helpful. I think I’ll start trying to tip in cash, even when I pay by card. Maybe useful for ppl traveling to Europe: in most countries you can’t pay by card anything else than the exact final amount on the payment note, which the waiter is required to give you. Also, waiters have a decent salary, rather than living mostly off the tips. Therefore, you most often can tip only in cash, and the tip, instead of being 18%-20%, as I learned is customary in the US, is usually in the range of 5%-10%, depending on how happy you are with the service. So you’re comparing “Europe” to “the US” and assigning the term “most countries” to the US? Clearly you’re not the mathematician. Besides, in the US, and Europe, and Africa (All of which I’ve lived in) allow you to add a tip to the total you pay by card, IF the restaurant has their machine set up to allow it. Richard, I think “most countries” refers to most countries in Europe. I guess reading comprehension was not the principal focus of your education. Just a tip, though: it’s considered bad form, in most countries, to snarkily judge someone who is not writing in his or her first language. I can’t remember the last time I was in a restaurant in Europe where the card machine didn’t have an option for adding a tip.. However we always check if tips are pooled or go to our server. But that doesn’t mean the restaurant isn’t paying tax on the cash you pay. It depends how they run their books, and often it’s easier to just pay tax across all the incomings rather than splitting it up. Technically they should be paying tax across all of it… it’s just that the cash is untraceable. The gov’t taxes the sale. The tip is income for the waiter. The gov’t collects income taxes separately. In many places the waiter add up their daily tickets, and are automatically charged to going tax rate on 36% of this total number. I see from a comment the CA rate is now 53%. Each shift, each person will add up their total tickets, and they will be taxed the rate according to the total daily amount. This is usually taken out of their pay-check. But this is different in each State. Here in Ok, they usually pay wait staff, less than minimum wage. Don’t ask me how this work out for State Taxation? I never could figure it out. I don’t like tipping in cash because cash tips tend to be under-reported on waiters’ income tax returns. With credit cards, however, it goes on a pay statement…and with that kind of paper trail, it’s harder to fudge numbers. Just about every waiter I’ve ever known personally has admitted to preferring cash tips for this very reason. I don’t like paying taxes, but I really don’t like other people not paying their share. “Their fair share” happens to be around 70%. If you give a $10 tip, after taxes the waiter gets to keep $3. Currently, the highest income tax is California where state and federal add up to 53%, and waiters are often paid minimum wage with the expectation that they will make a living off tips. Waiters are either pathetically underpaid and valiantly struggling to get by, crawling heroically up from soul-crushing poverty … or they’re cigar-puffing plutocrats being taxed at the maximum income tax rate along with Bill Gates and Steven Spielberg and David Koch. Pick one, you’re incoherent. (Oh, and you don’t understand marginal tax rates either, but sufficient unto the day is the fail thereof). You sure? That seems excessive. That’s above what I expect to pay here – in the socialist democracy Norway. And we get a *lot* more in terms of social benefits, right and freedoms for our tax dollars than Americans do. Can you show the math? As long as Wall Street billionaires can lie, cheat, and crash the economy with zero consequences, on top of their existing offshore tax havens, I’m not going to lose any sleep over some waiter near the poverty line not paying enough taxes. Yeah, those greedy overpaid waiters are really screwing the government out of a couple of bucks! They should just go on unemployment instead! Every place I’ve ever worked as a waiter, I’ve received my credit card tips in cash at the end of the night. I can’t imagine this not being standard practice because, paperwork-wise, it would be a nightmare to do it any other way. Did you or the restaurant have to pay the card processing fee on your tips? The restaurant did. I (or us in places where tips are pooled) got the full amount indicated on the receipt. I’ve read this three times, and laughed out loud each time. Thank you! A very humorous post! One of the few times I’d say lol and mean I actually did. Thanks – to their credit, economists do some awesome stuff with auctions… but they also talk a lot of gibberish. Hmm… well, soothsayers speak lies that everyone accepts, and jesters speak truths that no one heeds. I laughed out loud at least five times. Pretty funny except in real life, it would be the engineer telling the mathematician the simplified approach and not overthink it. You might be right – I found the engineer hardest to poke fun at. Mathematicians like to think that they have the upper hand on elegance; but engineers pride themselves on efficiency. Not sure which one would win out. Wrong. Engineers are taught to follow mathematical “recipes” to solve their problems, with little thought as to why they work, how they work or in which cases they work. It is always a mathematician who has to point out the error when their methods are inefficient or outright fail. Richard, from my experience, I agree with kontuz. Mathematicians love elegance. Sometimes they don’t ever care about the result to the problem but if the solution exists and is unique. An engineer, on the other hand, excels at finding the most efficient way to solve a problem, but, like a physicist, with a lot of approximations in the proccess. In the end, he just adds a “safety margin” to his results, so that the bridge doesn’t fall ahah. So a mathematician arrives at the university for a conference which will be starting the following morning. As is common practice, the conference organizers have booked him into the university dorms for the night (again as is common, this conference is being held during the summer, while classes are out and the dorms mostly empty). As the mathematician is drifting off to sleep, the fire alarm suddenly goes off, ringing with a loud and persistent screech. I took quite a few engineering courses during my under-grad and they were always the same: “Memorize these methods, and when you’re done, memorize these other methods”. If you point out that a method would completely fail in a large class of problems, then you’d just get the response “Oh, just try another memorized method if you get ‘weird’ results” with no thought at all as to actually teach when these methods work or how they should be applied. I even remember a guy in computer engineering who kept getting strange results in the research project for his thesis (It had something to do with networking the playstation 3 microprocessors, didn’t really pay attention to the details). No one in the department could figure it out (not even his supervisor who helped plan the project), so he went to a professor at the mathematics department for help. First thing the mathematician does is to point out that it’s no wonder he kept getting strange results when his whole project is theoretically impossible to achieve. 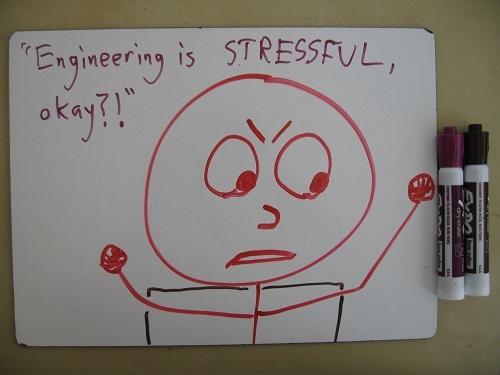 So no, engineers are good are not good at finding efficient solutions to general problems. Only the ones they have memorized. Wrong. Engineers are taught critical thinking which often includes mathematical modeling. One can argue that the Industrial Revolution began with the invention of the flyball governor for steam engines by James Watt in the late 1700s, which kept the steam engines from blowing up. A mathematical model of the flyball governor, wasn’t available for over 100 years when another Scottish engineer, James Clerk Maxwell, who also gave us Maxwell’s equations for describing electromagnetic wave dynamics, created a model of the flyball governor. Likewise, Alexander Graham Bell had no mathematical model indicating how far apart to place the amplifiers needed to build the first transcontinental phone line. Today we have no mathematical model for making cement even though we have been making cement for thousands of years. We also have no model of making steel or smelting aluminum or a host of other practical results achieved through experimentation (like making the first light bulb or making an airplane fly or making an electronic chip manufacturing plant profitable). This is just a vacuous statement. Everyone, from philosophers to biologists, will claim to have been taught ‘critical thinking’. Fact is that all engineering is built on physical laws, experimentation and mathematical methods. When did theoretical physics suddenly equal engineering? If you don’t even know the difference between these two subjects, then there really isn’t much hope for you. It seems you are confused between the difference of having an incomplete model and having no model at all. Engineers do not guess willy-nilly just because their models are not up to ‘your’ standards, they will still use (memorized) mathematical methods to determine whatever they’re trying to solve. Based on this comment and your follow-up, you either went to a school with a mediocre engineering program, or you’re making the common mistake of equating computer engineering with civil or mechanical engineering. As a mechanical engineer, I find the very concept of blindly using premeditated “recipes” instead of actually thinking about the problem offensive in the highest. In my line of work, that kind of thinking gets people killed. The university is consistently ranked among the best in Europe and it’s main focus is it’s engineering programs (which is mostly the reason why I couldn’t avoid them). All these engineering programs, from computer engineering to mechanical engineering, shared most of their courses for the first couple of years (including all the math courses), so I figure my experience is general enough. This was hilarious, and it just kept getting better! But 5 “math experts” seems a bit generous. That’s “tiny sub-subfield”, thank you very much. Don’t turn mathematicians into such generalists! You’re totally right. Anyone who claims to master a whole subfield is just a dilettante. Or Terry Tao. The tale of Professor Simpleton and Dr. Hardcase is about conventions for notation, but I link it here because I’m rather fond of the phrase “hypertwistoploppic pseudotheomorphisms”. 🙂 Yeah, Terry Tao totally doesn’t count: I look at some people who are really good at math, and feel a bit jealous that I’m not as good as them, but Terry Tao is one of those people where it’s so ridiculous that all I can do is laugh. John Cowan, that post was awesome, and quite honestly, there’s a non-negligible probability that “hypertwistoploppic pseudotheomorphisms” exists as a sub-sub-subfield or some other subfield that I’ve also never heard of. 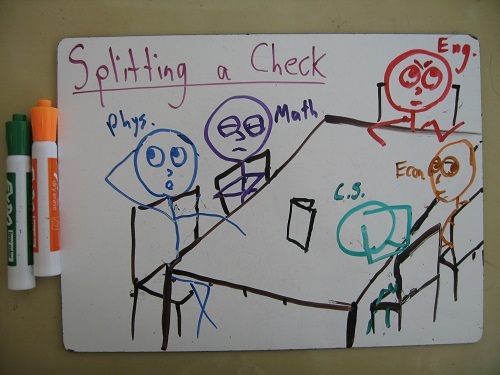 This is how an engineer, a mathematician, a physicist, a computer scientist, and an economist would split a check at a restaurant. Reblogged this on Geek Loves. Reblogged this on Quartz Contentment. How lucky they were not to have a lawyer present – she would have charged a heavy consultancy fee! True – and a doctor would have ordered MRIs for everybody, just to be on the safe side. very funny; but… all the physicist said for half the thing was “small error term”. repeated jokes in the same 500 odd words becomes a little dull. Thanks – a much better defense for reharshing the same joke than I was going to come up with! Hahaha…I’m actually neither of the above, but as an anthropologist it is the comment section the source of my absolute delight. Lol. I bet the anthropology of blog comments is a growing subfield. Typically enough, the economist (steeped by training in micro theory) ignored macro effects. If government expenditures are not paid for through the tax system, the government will have to borrow to make up the difference. While the resulting fiscal deficit may be stimulative in context of the liquidity trap in which we now find ourselves (in which traditional central bank actions prove ineffective), note that the economist does not account for what happens as the economy nears full employment again. Valid concerns. Also worth noting that most restaurant taxes go to local/state governments. Of course, local government spending should have the same stimulative effect as federal spending under the Keynesian view, but the specter of municipal bankruptcies ought to give the economist pause. Also, in the spirit of “yeah, us, too”: An experimental psychologist, noticing variability among the subjects, constructs a hierarchical regression model followed by discriminant analysis. The results show that 100% of the variance can be accounted for by discipline. She publishes the work in Psychological Review and obtains a large federal grant to continue investigating these marked individual differences. I didn’t have much of an answer for that, other than to point out that lots of economics is the opposite of common sense, still clothed in jargon. Oh, so that’s how the bill finally gets paid! From the federal grant for the study. That makes sense. Yeah, so she picks up the entire bill, plus tax and 20% tip. And charges it to the grant. Lol I never tip. Why? Because our wages compensate for it. I mean if it was really good, then tip a bit, but most times there’s no need. I was so confused in the USA with tipping and things that excluded tax. Why not just include tax? Shame on you! Don’t you realize that wait staff are paid significantly less than minimum wage because it is assumed they will earn tips? When you don’t tip, you cheat them of a living wage. The only reason to do that is REALLY bad service. You should apologize to every single waiter or waitress that you stiffed. And if you can’t afford to tip, then cook and serve your own meals for yourself at home, and stay out of restaurants. Sounds like Jason lives in a different country, right? Not tipping is pretty lousy behavior in the US, to be sure. If a server’s wage comes out below the legal minimum, I think restaurants are obligated to make up the difference. But even then, minimum wage ain’t exactly living wage in the states. That’s true under the federal Fair Labor Standards Act and, presumably, under the laws of many states. But in California, tipped employees still must be paid the California minimum wage (which is higher than the federal minimum wage) for all hours worked, with no reduction for tips received. Further, they cannot required to tip out to (or to tip pool with) owners or managerial employees. Still, minimum wage isn’t much. I always tip on the full amount of the bill (including tax). >> When you don’t tip, you cheat them of a living wage. No, they already cheated themselves out of a living wage when they accepted the job. Thats the free market economy in action right there. As a European who moved to the US, this has always been a conundrum for me. I don’t understand how the problem of the company they work for not paying their employees enough in the US becomes my problem just because I happened to go there to buy food/whatever. In Europe, people just wouldnt take the job in the first place, so they’d have to raise their wages just to get anyone to work there. The intent of tipping (at least in Europe) is to reward someone who has done something above and beyond normal levels of service, not just fulfilled their job as expected. Consequently, you don’t normally tip in Europe, and certainly not the traditional 15-20% or whatever that is “expected” in the US. The whole notion of a tip being “expected” in the first place is ridiculous IMHO. Autres nations, autres mores. The British think (most of) the rest of us are absurd for driving on the right. I mean, it obviously makes sense to mount your horse on the left side of the road, because you need to get on your horse from the horse’s left side. If you don’t, you’re going to impale the poor horse on your sword (which of course you wear on the left so you can rapidly draw it with your right hand). Anyway, right-driving was introduced into Europe by Napoleon, and we all know what a tyrant he was (even if he did once shoot a publisher). Or to put it another way: When in Rome, shoot off Roman candles. Thanks – sounds like a fun degree. Two things I wish I’d studied more. I’ve had dinners like this. Sorry but I don’t get the tax bit. Not being from the US, what is the 8% tax and, is it not included in the price of the food on the menu, or is it included and then when the check is payed deduced for the calculation of the tip? We don’t have the VAT here in the US. Taxes are charged separately, on top of the listed price. Sales tax is charged on certain items, including meals eaten in restaurants. The sales tax varies from state to state, as well. Here in New York, it’s 8%; it’s higher and lower in other places. Statistician: Let’s just play credit card roulette. If we eat many meals together, our expected value will be the same over the long run. I would propose doing that with friends, although it’s gotta feel awful when your card comes up. I’m a little variance-averse. Reading this I had a flashback (many flashbacks, actually) to various family discussions where we had in attendance — and with opinions galore to share — an economist, three engineers, two physicists, a psychologist, and a computer scientist. 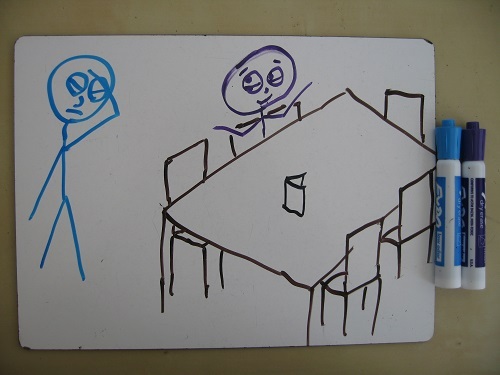 Family dinner was in fact more of a debating club, often about irrelevant and meaningless things. Great way to break bread together…! That’s the best kind of dinner table. I keep it simple. I multiply the total by 10 (which I can do in my head) X2 gives me 20%, which I consider a good tip and usually the service I receive is good and I know it’s a hard job, and usually a severely underpaid one because businesses can get away with paying $2-3 an hour because the minimum wage doesn’t apply to restaurants. Is the service is so-so, then 15%. I’ve rarely given 10%. The 5’s are just easier to do in my head and makes up for my using my debit card to pay. That way they don;t get cheated by the card companies. Just too funny to take it in one go 😀 … can put a while loop for each newline as a potential quote !! Reblogged this on Saad Gulzar. Interesting that they “each had the same thing” so the engineer could have just divided by 5. And yet only two orders of fries! I have a mathematician friend, who, whenever I ask for her help in figuring out the tip, irritably reminds me that she studied MATH, not ARITHMETIC, so you really nailed that. Did no one catch the point where the mathematician comes to the same conclusion the physicist had already reached-the even split? Completely geeky but I loved it.